KIEV, Ukraine -- As the country prepares to mark — “celebrate” seems much too strong a word — the second anniversary of its democratic revolution, many Ukrainians say they feel the country took a wrong turn after the dramatic, bloody uprising that ousted their pro-Russian government. 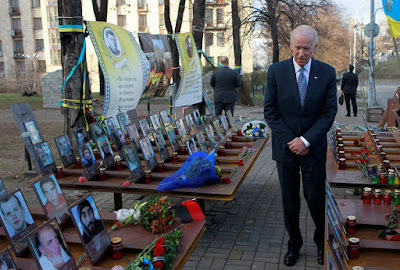 Vice President Joseph R. Biden paid his respects in honor of the "Heavenly Hundred" during a ceremony at the monument dedicated to them in Kiev, Ukraine, on Dec. 7. The "Heavenly Hundred" is what Ukrainians call those who died during months of anti-government protests two years ago that ended in new leadership but not much change. It was two years ago that the first protests in the heart of Kiev set into motion the events that would drive Moscow-backed President Viktor Yanukovych from power and into exile in February 2014. But the activists who watched the government’s security forces kill more than 100 pro-Western protesters who camped out in the Ukrainian capital’s central Maidan Nezalezhnosti, or Independence Square, now accuse their ostensibly democratic leaders of corruption and failing to honor the sacrifices of the slain. “The people have paid a high price to change the system,” said Yaroslav Hrynyshyn, a protester wounded in the revolution. The dissatisfaction reveals the deep political divides that still plague Ukraine, a country dealing with the aftershocks from an abrupt regime change, the struggle to find a capable generation of leaders, and economic stagnation. That’s not even taking into account the upheavals brought on by Russia’s annexation of Crimea and the stalemated civil war with Russian-backed separatists in the country’s eastern half. Mr. Hrynyshyn, a 50-year-old music teacher, nearly lost his hearing after a stun grenade exploded near him as riot police dispersed the protesters’ camp in February 2014. He required six months of medication. Today, he doesn’t see the positive changes that he and other protesters hoped would transpire after Yanukovych fled the capital and eventually crossed the border into Russia. “Corruption goes on everywhere,” Mr. Hrynyshyn said. Ukraine’s Western partners seem to agree. “Ukraine cannot afford for the people to lose hope again,” Mr. Biden said on Dec. 7. Signs of real progress since 2013 are hard to see. Public integrity watchdog Transparency International listed Ukraine as 142nd out of 177 countries in its world ranking last year. In 2012, under the old regime widely suspected of embezzling public funds and lavishly dispensing cash to its cronies, the country scored 144th out of 177, only marginally worse. In both years, Ukraine ranked as the most corrupt country in Europe. Democracy watchdog group Freedom House, meanwhile, lowered Ukraine’s scores this year for governance and anti-corruption actions to their lowest in the past three years. Ukrainian domestic critics complain of corruption scandals in state agencies that are never resolved and the lack of prosecutions of former regime leaders who remain in Ukraine. Several of the Yanukovych government’s top officials were interrogated for abusing their authority, but without results. “All the corrupt officials took it as a signal that they can proceed with the old ways,” Mr. Hrynyshyn said. Others cited the persistence of petty venality among civil servants under President Petro Poroshenko bribes, embezzling and other dishonesty. Video of brawls among lawmakers in the Rada, the Ukrainian parliament, have gone viral on the Internet and done nothing to boost backing for the government at home. “Back then, I was ready to give my life for the ideals we fought for,” said Serhiy Klimov, a 26-year-old Kievan, referring to his participation two years ago in what has become known as the Euromaidan movement. Popular reforms, such as a much-anticipated visa-free regime with the European Union, have languished in parliament, although a tentative deal with the EU was announced late last week. A recent poll found Prime Minister Arseniy Yatsenyuk’s approval rating at less than 2 percent. Mr. Poroshenko and Mr. Yatsenyuk have been understandably focused on the clash with pro-Russian separatists who have formed breakaway regions in eastern Ukraine with military aid from Moscow. President Vladimir Putin acknowledged just last week for the first time that Russian intelligence forces were operating in eastern Ukraine, although he still insists regular Russian soldiers have not crossed the border. But even Mr. Stoltenberg pressed Mr. Poroshenko and the government in Kiev to address the issue of corruption. The conflict killed more than 9,100 people since it began in March 2014, cost Kiev the Crimean Peninsula and cut off Ukraine from some of its biggest industrial centers. Fighting in the undeclared war has undermined Ukraine’s already weak economy and sent its currency, the hryvnia, into free fall. Inflation has run at 79 percent compared with two years ago, while gross domestic product fell by 13 percent in first nine months of the year, partly because of the loss of 7.3 percent of its territory. Economic Development Minister Aivaras Abromavicius this month predicted that GDP would post a small gain in the final quarter and growth would pick up next year, but the government also said last week it wouldn’t repay a $3 billion debt owed to Russia by this weekend after Moscow’s refusal to accept repayment terms already offered to other international creditors. The “moratorium” on outstanding debt repayments to Russia effectively means that Ukraine is defaulting on a $3 billion debt due Sunday and could jeopardize crucial loans that Ukraine has been receiving from a $17.5 billion bailout deal with the International Monetary Fund, The Associated Press reported. Kiev-based political scientist Andreas Umland argues that the Ukrainian government’s ability to simply survive the crisis-packed period was success enough for the Euromaidan revolution. “The main achievement is obviously the prevention of the collapse of the country,” he said. Even so, corruption presents a mortal threat to the legitimacy of Ukrainian leaders. Mr. Poroshenko took responsibility recently for a series of corruption scandals in the government prosecutor’s office and Defense Ministry — both of which he controls. He also disappointed voters when he refused to sell his business after he was elected, something he promised to do prior to the election. Mr. Poroshenko became a billionaire in part by parlaying his commercial and political contacts to acquire much of the Ukrainian chocolate industry in the 1990s. Activists said the problem is clear: Oligarchs like Mr. Poroshenko who ran Ukraine before the revolution remain in control despite the change of regime. “The people who came to power are the people from the old system, who worked with Yanukovych,” Mr. Hrynyshyn said. Critics note that roughly half of the members of parliament elected after the revolution are newcomers, while the other half held seats under the old government. Both Mr. Poroshenko and Mr. Yatsenyuk are political veterans. Mr. Poroshenko even briefly served as a minister in Yanukovych’s government. Still, Mr. Hrynyshyn said he would join the revolution once again despite knowing how little has changed. “The revolution didn’t fulfill its mission just yet,” he said. Mr. Klimov is a less optimistic. He recalls Ukraine’s Orange Revolution of 2004, when the people revolted against Yanukovych for the first time. Yanukovych lost his bid for the presidency at that time after massive protests erupted over accusations of voter fraud and other electoral improprieties. But he went on to serve as prime minister a few years later and won election to the presidency in 2010. The 2014 revolution erupted because of dissatisfaction with the shortcomings of the Orange Revolution a decade earlier, said Mr. Klimov. The failure of the Euromaidan uprising could mean grave danger for a disillusioned country. “I’ve taken part in two revolutions,” Mr. Klimov said. “But it takes longer than one year to build a good house"
In the US, people in communities would all get together and raise a barn or build a house in 1 DAY! In Ukraine, the instructions for building a good house have been on file, from the Venice Commission, from the EU, from the US, from Canada, from England, for over 20 years. But the instructions are not being followed, and even worse, under the current system, entrenched corruptioneers are doing everything they can to sabotage and prevent the house from being built.